I reluctantly made my way to the modelling poster presentations. There’s a grimy romanticism to agriculture in the tropics and subtropics, it’s hot, sweaty and dirty. Even measuring the leaf area index with a Plant Canopy Analyzer requires patience in sweltering heat. Modeling conjures a different image, endless hours staring at a screen tinkering with a tangled web of components. This is only half the story, it also requires intensive field work too. Models can only be created and calibrated based on real data. Above all, modeling is part of the future of agriculture. Without it, it’s nearly impossible to show the advantages of intercropped systems, or the diffuse impacts of global warming. Unfortunately, the poster session just made a complicated subject more obscure. The noise drowned out most of the presenters along with the questions. Regardless, I got enough of an impression to make a list of my favorites. I made sure my choices made sense by pulling aside a modeler from the audience. The youth is the future, and their crucial role in the future of agriculture is undeniable. Thus, how can we support them in agriculture? 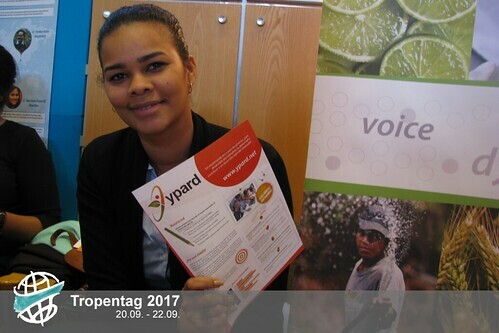 To find the answer, Young Professionals for Agriculture Development (YPARD) initiated the discussion among young researchers at Tropentag 2017. As an international network of more than 13,000 members, YPARD serves as a global collective platform that allows interested young professionals to connect and contribute proactively to agriculture. 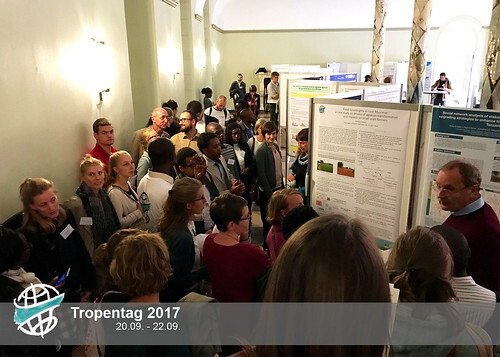 This year, YPARD Europe, together with the International Association of Students in Agricultural and related Sciences (IAAS) organized an interactive session at Tropentag 2017. The workshop was the chance for young researchers to express their ideas and opinions to find practical solutions to improve youth involvement in agriculture. With a friendly and dynamic culture, YPARD creates a place for young generation to interact, network and encourage themselves to work actively in agriculture. As a young researcher in agriculture, I found YPARD attractive because it offered access to an international network. If you want to know more about them, find their details at their information booth in the AULA. Soil, soil everywhere, but not a spot to plant. Land degradation is an important global environmental issue in the 21st century and is having a huge impact on agricultural productivity, food security and livelihoods. Moreover, as Tony Simmons, director general of the World Agroforestry Centre (ICRAF) stated, economic losses from it account for a loss of $10.6 trillions a year. Rice is one of the most important staple crops in the world. A lot of research has been conducted, but more investigations are needed in order to optimize land use by maximizing yield. Ulrike Beukert, a MSc. 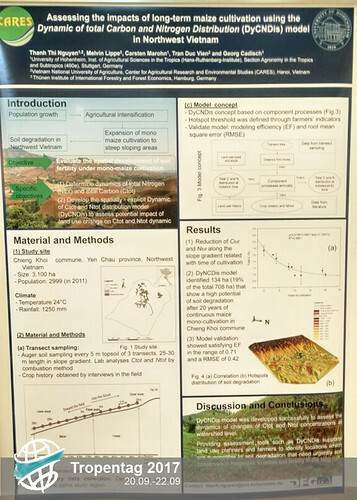 student at the University of Martin-Luther-University of Halle-Wittenberg, conducted an investigation on boosting yield by exploiting heterosis in rice. Results show that heterosis provides enhanced yield stability and increased abiotic and biotic stress resistance. 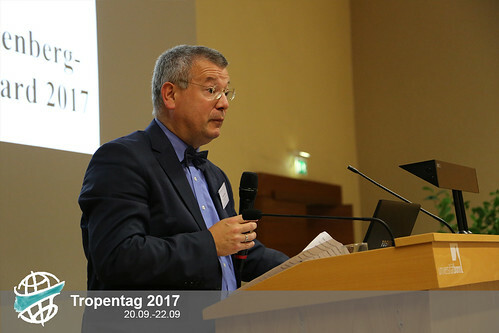 Even though the first poster session of Tropentag 2017 began late in the afternoon in the AULA, the audience was still excited and enthusiastic for the 11 presentations on Central Asia. Honestly, one hour and a half is not enough time for all the researchers to present their work in the depth their passion showed they deserved. And that was exactly the case for Welcome Zimuto from the Czech university of Life Sciences. He brought to the session a poster describing his work on modeling alternative profit maximisation and crop-land allocation strategies for two cooperative herb farms in Georgia. Although the limitation of the model he used was when the price of inputs fluctuates, his results are applicable and should interest further development. Meanwhile, Elena Kan presented her research on communication strategies for preservation of the flood-plain forest in the Amudarya River Basin in Uzberkistan. Her efforts to work with a variety of different stake holders for her research was both interesting and valuable. Late start. Inaudible. THE NEW DIRECTION OF AG! One audible theme carried across the session: a need for distinctly long-term thinking when seeking solutions for food system transformation. Despite the challenging circumstances, the fourteen presenters of Poster Session 1 "Institutions and Livelihoods" on Wednesday afternoon brought innovative research into discussions of gender and rural sociology. 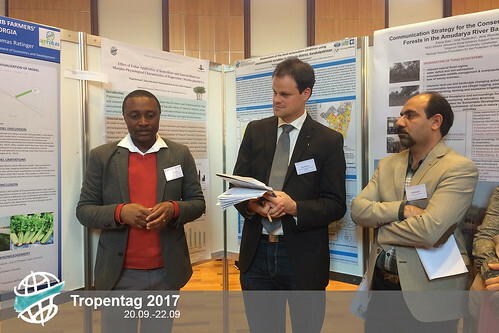 From whether childhood experiences influenced the decision to migrate or not from rural areas in Ethiopia, to considerations of gender and social hierarchy in forward-looking decisions within Tanzanian vegetable production, these posters were representative of the direction future agricultural research is moving in. While not complaining about the additional 60 seconds added to her presentation time due to the late-start and missing presenters, Mst. Tania Parvin from the University of Hohenheim explained, "I think next time we should start on time... the last person might be presenting in front of no audience. "Speaking from an air of frustration with the volume of the presentations Parvin's colleague Mary added the suggestion, "Maybe next time they should provide a mic?"